Matrox Concord PoE is a new generation of Gigabit Ethernet adaptors for interfacing one or more GigE Vision cameras supporting PoE. Matrox Concord PoE Available with two or four Gigabit Ethernet ports, these network interface cards (NICs) simplify system configuration, not only by handling command and streaming protocols but also providing power over a single standard Cat 5e/6 cable per camera connection. An isolated PoE implementation protects cameras, board, and host computer from damage due to electrical faults and stray current that adversely affects camera detection. Capture images at the highest Camera Link rates with support for the Full and 80-bit modes at up to 85MHz (single-Full model). Eliminate lost pixels through a PCIe® 2.0 x8 host interface and ample on-board buffering. Reduce cabling and eliminate power supplies by way of Power over Camera Link (PoCL) support. Offload and accelerate image processing to free and assist the host CPU using an Altera® Stratix® V FPGA. Simplify the development of custom on-board image processing using the optional Matrox FPGA Development Kit (FDK). Reduce development and validation costs through a managed lifecycle offering consistent long term availability. Implement image capture with ease and confidence using Matrox Imaging Library (MIL) application development toolkit. Maintain flexibility and choice by way of 64-bit Windows 7/8.1/10, Linux®1 and RTX641 (RTOS) support. The Matrox Concord PoE board gives access to the GigE Vision support in Matrox Imaging software, thus removing the need for an additional feature license. The card also acts as a license fingerprint and can store a supplemental license for Matrox Imaging software, avoiding the need for a separate hardware key. Matrox Concord PoE is supported by both Matrox Imaging Library (MIL) and Matrox Design Assistant software. Each software offers developers a different environment with the same underlying vision tools. MIL is a comprehensive software development kit (SDK) with a 25-year history of reliable performance. This toolkit features interactive software and programming functions for image capture, processing, analysis, annotation, display, and archiving operations, with the accuracy and robustness needed to tackle the most demanding applications. Refer to the MIL datasheet for more information. Matrox Design Assistant is an integrated development environment (IDE) for Windows® where vision applications are created by constructing an intuitive flowchart instead of writing traditional program code. 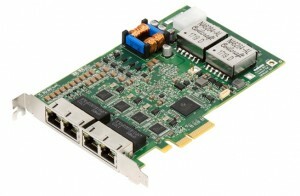 Matrox Design Assistant’s IDE also enables users to design a graphical web-based operator interface for the application. Refer to the Matrox Design Assistant datasheet for more information.